I felt the French Sheets (noted below) deserved its own post. As I'd mentioned, this was an impromptu invention of Damon, our bartender at Death & Co. Shake vigorously with ice, strain into a chilled cocktail glass, and serve. 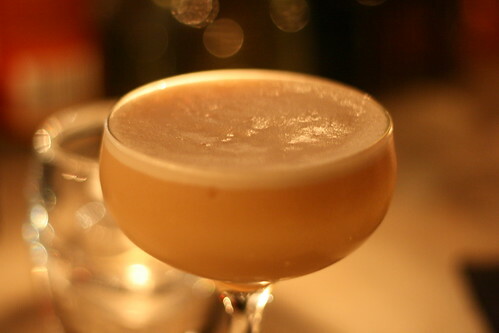 Incidentally, Damon created this drink using Rittenhouse rye, and it was quite delectable. (I'd be interested in trying other ryes, or even an oomphy bourbon like Bulleit or Knob Creek in this. I finally got around to making this one... I used Sazerac rye, Regans' orange bitters, and the Fee whiskey-barrel-aged in place of Angostura. In a word: Gorgeous.